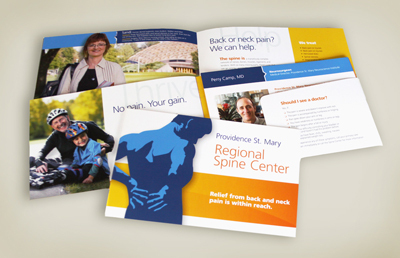 This spine brochure was part of a spine campaign for one of our clients, and served as a flexible tool that not only promoted the program but its numerous physicians. To make the piece easily customizable for each physician office, we created a folder in the back to hold a card on each physician. As physicians came and went, these cards could easily be updated without outdating the brochure. But creating a brochure is just the first step. Give thought to how it will be distributed. We recommended to this client that they mail it to referring physicians with a cover letter, distribute it through the participating physicians' offices, and distribute it to hospital staff, since they serve as sales people.